Providing you the best range of dew point meters for compressed air & gas with effective & timely delivery. We offer our customers a wide range of Dew Point Meters / Moisture Meters, which is known for being economical, single channel, aluminum oxide dew point meters that offer low cost, accurate and real-time moisture measurements. These meters use thin-film aluminum oxide moisture sensor probe. Our microprocessor based meters are suitable for moisture measurement in gases and liquids over a wide range of process conditions. They track fast changing process conditions and displays dew/ frost point temperature in deg. C or deg. F on a 6-digit LCD. Further, these have built-in optical isolation that ensure that the integrity of signals to recorders, computers and other remote devices. Range: 20 Deg. C. to (-) 110 Deg. C.
Accuracy: + 2 Deg. C.
Display Function: Dew / Frost point temperature Deg. C. or Deg. F.
PSA Nitrogen Gas Generator and Oxygen Gas Generator. 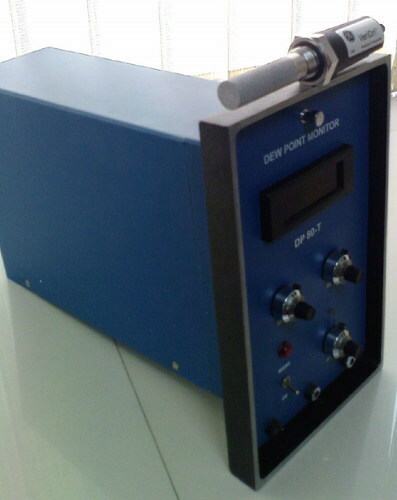 Looking for “Dew Point Meter”?